×5th Annual Hop, Skip & a Jump is not accepting new registrants at this time. Online registration has closed. Families and individuals may register at the event tomorrow morning (Sat. Mar 9th) starting at 9:30 am. Come Hop, Skip & Jump with us! 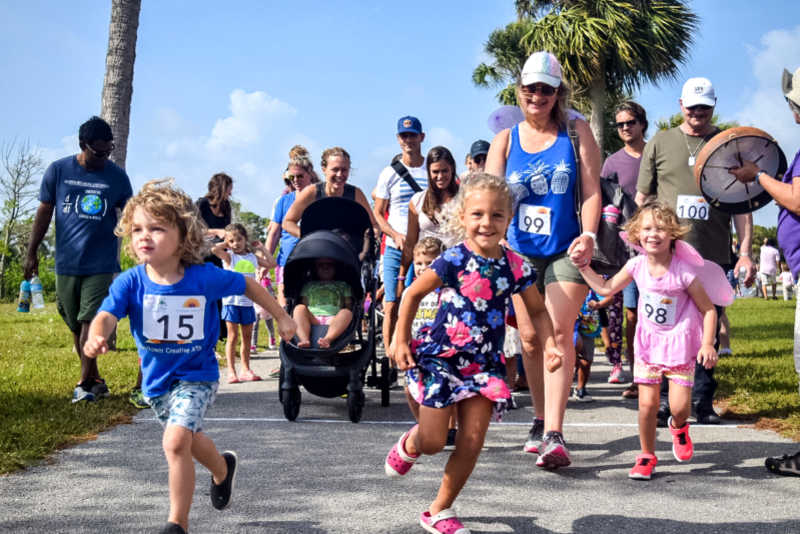 Saturday, March 9, 9:30 am, at John Prince Park in Lake Worth– join us for our 5th Annual crazy playful walkathon, where all funds raised will benefit Sunflower’s Play + Nature + Art programs. This event is open to families of all ages and abilities, as well as strollers. The walkathon path will include hopscotch, music making, walking like your favorite animal, and much more! Please join us for this fun event by signing up here. Family registration is only $50 for a family of up to 2 adults and 4 kids. Online registration will close at 12:00 pm on Friday, March 8. Day of registration will take place at the event, $50 a Family team - cash, check or credit card. Money raised will benefit Sunflower Creative Arts’ Play + Nature + Arts programs If you can’t come, we’d love to have you pledge your support through one of our participating families. Many thanks to our 2019 Hop, Skip & a Jump Sponsors! If you are interested in a business sponsorship please email ilysia@SunflowerCreativeArts.org for the details. ✨💫A three day/two night stay in a Cloister Estate Room at the Boca Raton Resort & Club! Other prizes include a Private Wine Class for 20 ($500 value) from Total Wine & More and two beautiful prints from Ben Hicks Photography. EVERY HOP TEAM participating Saturday will automatically get one free Finale Raffle ticket. And for every $100 your team raises by 10am March 9th, you will get one more ticket. So, if you are a participating team and raise $200, you will get three Finale Raffle tickets - one for being a participating team, and two for the $200 you helped raised. And anyone at the event will also be able to get additional tickets for a suggested donation of one for $20, and three for $50. *Punta Mita prize can be extended (depending on availability) for discounted rate of $250/night! Available July-Oct 2019 based on availability with minimum 2 weeks advanced notice. Maximum 8 people. Requires $200 non-refundable cleaning fee, $300 refundable security deposit, and your own travel arrangements. This raffle drawing benefits Sunflower Creative Arts, Inc., a 501 (c)(3) organization. Address: 227 N Dixie Blvd, Delray Beach, FL 33444. All raffle prizes have been donated to Sunflower Creative Arts. The winners will be chosen on March 9, 2019 at 12:00pm and announced live at John Prince Park, Lake Worth. Winner must be present to win, and only one (1) individual can win either of the grand prizes, not both. Suggested donation of $20 per one ticket, or $50 for three. While no purchase or contribution is necessary, one hundred percent of all contributions will benefit this organization, so we hope you will fully support us. Florida Department of Agriculture & Consumer Services Registration #CH18855. A COPY OF THE OFFICIAL REGISTRATION AND FINANCIAL INFORMATION MAY BE OBTAINED FROM THE DIVISION OF CONSUMER SERVICES BY CALLING 800-435-7352 WITHIN THE STATE. REGISTRATION DOES NOT IMPLY ENDORSEMENT, APPROVAL, OR RECOMMENDATION BY THE STATE. The team who raises the most money will win this local staycation package, worth over $500, filled with two days/one night at The Colony Hotel & Cabana Club, a $100 gift certificate to Benny's on the Beach, and other prizes to create a fantastic weekend. This package, worth over $500, is for the team who gets the highest number of donors. It's filled with prizes including passes for the Palm Beach Zoo, Boomers, and Palm Beach Skate Works. Any team who raises $250 or more will be entered into this raffle, with multiple chances to win prizes from places such as Zoo Miami, The Orchid Nest, Organic Movements, and Bedner's Farm Fresh Market. Any team who gets 2 or more donations of any amount will be entered into this raffle, with TEN chances to win prizes including Trader Joe's, Barrel of Monks, Ross Dress for Less, and Skyzone Trampoline Park. Thank you to our 2019 Hop, Skip & a Jump-A-Thon Sponsors, Shtulman Family Chiropractic, True Floridian Realty, First Home Mortgage, www.flmmkr.org, Royal Life Centers, helping us celebrate 26 playful years! Sponsorship opportunities are still available. Please contact Ilysia Shattuck at 561 501-6615.